Moreover, many of these jobs come with promising career growth in esteemed government organizations. After completing the BBA, You can apply for job posts like IAS and IPS by appearing in CSE conducted by UPSC. To get these highly reputed jobs, you have to crack the civil services examination conducted by UPSC for these posts. As the BBA graduates have already studied Administration during their graduation; therefore, they are good for administration services and will definitely serve the nation better with their knowledge. There are a total of three stages for the selection of the candidate, i.e. Preliminary exam, Main exam, and the interview. For mains exam, one has to select an optional subject according to their expertise. There is a list of optional subjects for civil services main examination. BBA graduates can majorly choose for Commerce and Accountancy, Economics, Management, Public Administration and Statistics, etc. There are many public sector banks in India recruiting graduate students for different posts. These banks recruit clerks and Provisional Officers (PO) by conducting an online exam. SBI conducts paper for clerical cadre and Officer Cadre separately for recruiting the candidates. All banks, except SBI, recruits through Institute of Banking Personnel Selection (IBPS). IBPS conducts two exams annually namely, IBPS clerk and IBPS PO. Regarding the selection process, there will be a preliminary written exam followed by a mains exam and a personal interview (No personal interview for clerical cadre recruitment). Syllabus for written exam consists broadly of General English, Reasoning, Numerical Ability, Marketing Aptitude, and General awareness/ Computer knowledge. Moreover, the banks have started recruiting officers in Specialist cadre for the post of Specialist Officer (SO) in various fields like Marketing, Management, Finance, etc. This is another great job option for BBA graduates. The entrance exam for this job post is conducted by SSC (Staff Selection Commission) every year. Your nationality must be Indian. The height of the male candidate should be 157 cm at least. The height of the female candidate must be 152 cm at least. Selection Process: A written test will be taken to examine the knowledge of the candidate. Written test contains – English, General knowledge, General, and Reasoning. Then, the candidates are selected according to their merit. There is nothing more prestigious than serving your beloved nation and its people by joining the armed forces. You can join defense services like Indian Army, Indian Navy, Indian Airforce, etc. through the CDS (Combined Defense Service) entrance examination or the SSC (Staff Selection Commission) entrance examination. BBA graduates can enter the defense services by appearing in CDS exam and clearing the same. 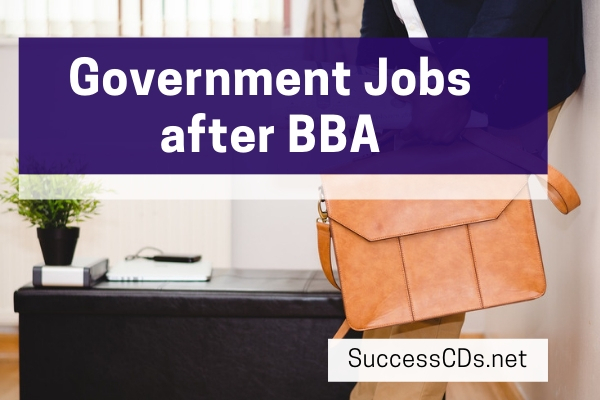 Many PSU's and Government departments other than bank recruits the BBA graduates for various business and commerce operations like Finance, Marketing, Accounting, Business Development, Human Resource Management, Tourism Management, Real estate, etc. The selection process in these government departments’ job posts: Candidate has to go through the entrance examination and the interview conducted by these government departments individually. Common Graduate Level (CGL) exam is conducted by SSC (Staff Selection Commission) every year to recruit desirous candidates for various job posts under different government departments and ministries. BBA graduates have this opportunity to secure a good post in their native department like the Ministry of Finance, Income Tax Department, CAG office (Comptroller and Auditor General of India), etc. SSC CGL has basically three steps of examination. Tier 1 and Tier 2 are objective type papers and Tier 3 is a descriptive type paper mainly consisting of essay writing, application, letter, etc. in the exam. This exam carries 100 marks and 60 minutes are allotted for the exam. For some posts, Tier 3 is followed by a skill test or a typing test, etc. Apart from these career job options, there are many other fruitful opportunities are available; therefore, prepare accordingly and get success by landing government job in your favorite department.